Colour photographs 38" x 26" and 37" x 26"
These photographs are panoramas; composite images, each made up of 15 photographs, taken every half hour during the gallery's hours of operation. 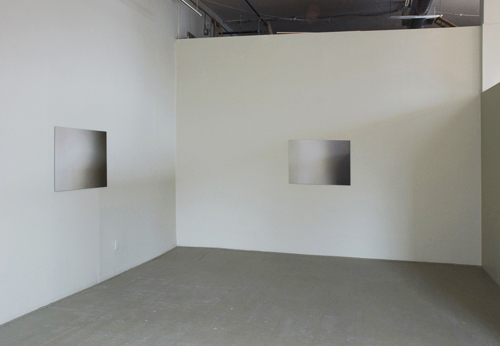 The photographs of the two walls were taken virtually simultaneously and by using only the natural light from the gallery windows. The cameras were swiveled slightly between each shot, so that at the beginning of the day they were pointing at the left side of each wall and by the end they were pointing at the right side. The photographs were each exhibited on the same wall that is its subject.